Another line of roses that I can highly recommend is the OsoEasy® Roses by Proven Winners. This is a growing line of landscape roses that comes in a wider variety of colors than any of the other offerings on the market. While Proven Winners advertises most of the roses as generally 1-2′ tall, mine have gotten easily 3′ tall–still a fairly dwarf size for a mature rose. They are hardy, disease and pest resistant and drought tolerant and they do bloom all summer as well. Currently there are 13 roses in this series and I believe Proven Winners continues to add roses each year. I received my First rose, Oso Happy Candy Oh! (botanically Rosa ‘ZieMartinCipar’) in 2010. It came late that season and probably didn’t get into the ground until July. That summer was quite hot, with many days in the 90s and a few over 100. The bed I put them in doesn’t have ready access to water (like most of my yard) and because of my heavy clay, I don’t mulch because that just invites disease and fungus, rather than preserving soil moisture. So to ensure you understand the picture, I plunk 4″ roses down into an unirrigated bed in the middle of a hot July and leave them to sink or swim. Got it? 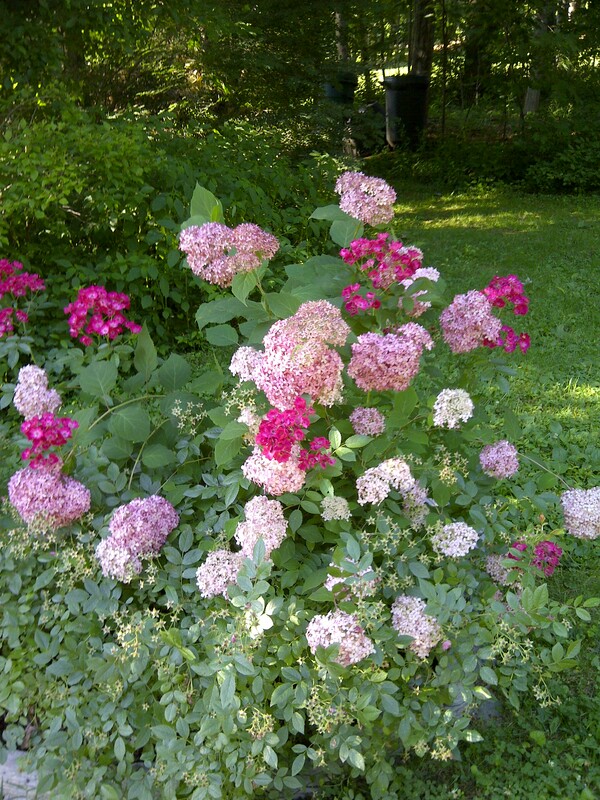 They survived my New England winter and bloomed beautifully the next year, 2011. By 2012, they were blooming so beautifully (at top, with another Proven Winners shrub, the hydrangea, Invincibelle Spirit [again, botanically hydrangea arborescens ‘NCHA1’]) I didn’t know how I’d gardened without them! Since 2010, Proven Winners has sent me two other roses in this series to test (Full disclosure: I regularly test shrubs for Proven Winners and they provide me with these shrubs). I have received Oso Easy Peachy Cream and Oso Easy Honey Bun, both roses in the peach, yellow, cream family (my favorite color family, just by chance). Both of these are still immature and not as prolific as Oso Happy Candy Oh! but they certainly have proved as easy and carefree in terms of watering requirements, and pest and disease resistance. I cannot say enough good things about these roses. And yes, they too resist that nasty sawfly larva that so disfigures my David Austin roses. So if you’re looking for a rose that isn’t a Knock Out rose, this might be the one to try! Next Article Wordless Wednesday–What’s Wrong With My Rose Leaves?